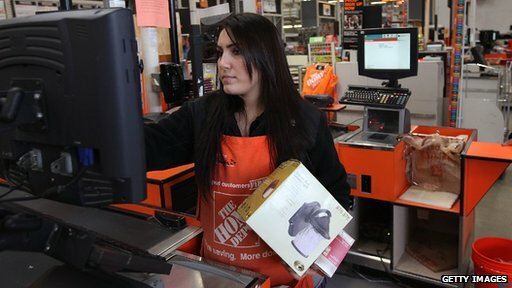 US-based DIY chain Home Depot has said it is investigating "unusual activity" relating to customer data. The announcement follows a report by prominent security blogger Brian Krebs, who suggested the company might have fallen victim to a credit card breach extending back to April or May. The retailer confirmed it was working with "banking partners and law enforcement" as part of its inquiry. Mr Krebs was previously the first to report about Target's breach last year. The general goods retailer later confirmed that 40 million credit and debit cards belonging to its shoppers had been compromised over a three week period. Its chief executive resigned as a consequence, and the company said last month that the episode had cost it $148m (£90m) to date. Mr Krebs said a breach at Home Depot had the potential to be "many times larger", bearing in mind the company operates 2,200 stores in the US. He said that the matter had been brought to his attention after a large number of stolen payment card details were posted to an underground forum. "Protecting our customers' information is something we take extremely seriously, and we are aggressively gathering facts at this point while working to protect customers," said Paula Drake, a Home Depot spokeswoman. "If we confirm that a breach has occurred, we will make sure customers are notified immediately. Right now, for security reasons, it would be inappropriate for us to speculate further." Security experts have suggested that the US is more vulnerable to credit card hacks than many other countries because it still relies on payment terminals that scan the magnetic stripe on the back of cards, giving malware an opportunity to copy the data. However, US stores will begin using chip-and-pin and chip-and-sign systems next year that will add encryption to safeguard details. Home Depot's shares fell 2% on Tuesday, making it the worst performing stock in the Dow index.